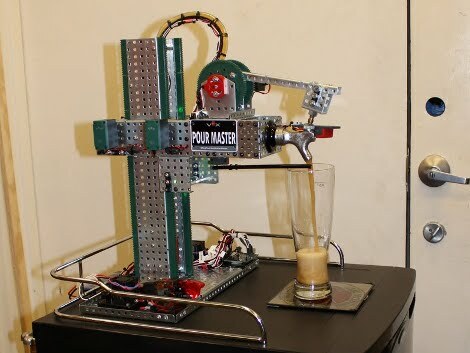 The Pour Master Pro is a beer pouring robot, designed and built by a team of beer/robot lovers as their entry to the Red Bull’s Creation Contest. Pour Master keeps it simple (opposed to some of the other bar bots we have seen), it uses a modified kegerator and tap for the beer, and a few sensors which it uses to maintain its state and pour the perfect beer. The standard tower on the kegerator was replaced with a rack and pinion driven tower constructed using the Vex Robotics Design System, this allows the Pour Master to set its height to the size of any glass using a limit switch and a set of ultrasonic rangefinders. For a perfect pour the beer must not spill over the side of the glass and needs a decent 3/4″ head, to manage this the Pour Master uses the ultrasonic rangefinder to detect the thickness and height of the head. The entire thing is controlled by an Arduino running a finite state machine which provides state feedback to the user with an LCD display. Check out the video after the break for their competition entry, now all you need is one robot to make the beer and why not another to drink it. After having his mints disappear for quite some time [Quinn Dunki] came up with an idea to get back a the fresh-breath thieves. 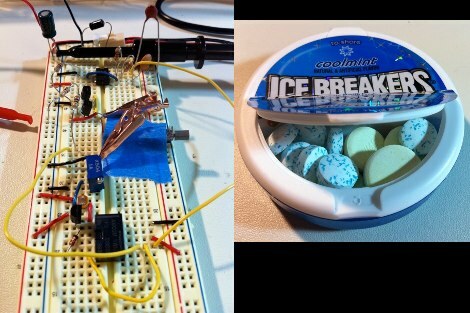 A bit of circuit design, parts scavenging, and free-form construction led to the creation of his mint-tin burglar system. Here’s how it works. Flip the on/off switch in the base of the mint tin before you head off for lunch or a coffee break. When the foul-mouthed pilferer hits up your stash they’ll get what they were looking for at first. But by opening the tin they tripped a timer circuit that will send the mints vibrating across the table soon after having been opened. The breadboard above holds the prototype timer circuit, built around or friend the 555 timer. The vibration motor from a cellphone is a perfect choice for this hack as it’s very small and is just waiting to run from a low-voltage source. We especially liked the use of the cells from inside a 9V battery as a power source and the compact assembly that manages to fit inside the mint container. [Richard] has been working on the concept of “incorporating more feeling into our digital objects”. His design is still just a concept but hopefully someone will take up the idea because we think the results would be amazing. The attention to detail in the design is impressive, the Rotary Mechanical Smartphone as he is calling it contains a generic smartphone maintaining all the features such as the touch screen, but also including a set of interchangeable rotary dials on the back. There is the true rotary dial just like an old phone and a push button dial, for complete integration of the old and new technologies. Once the design was complete, Richard built himself a proof of concept model to show off his work. The shell was 3D printed and copper plated to get the desired steampunk finish. The rotary dials are made from brass plate and hand finished. [Richard] has put in a lot of effort getting the finish right with electroplating, painting, and sanding. The final results are nothing short of impressive. Check out his site for some very nice photos and build details. 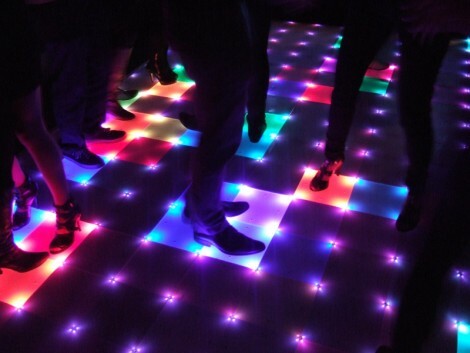 Your party is lame if it doesn’t include interactive blinking lights on the dance floor. [Mario] and [Lukas] didn’t want to have lame parties, so they enlisted some fellow students to build an interactive dance floor (translated). The finished party-piece is 4 meters by 2.5 meters (that’s about 13’x8′ for us yanks) and includes 160 lighted squares. But it’s the electronics that really make this a heavy project. Milled into the underside of the pressboard base are a series of pockets and channels to hold various components. If you look hard enough, you’re going to find eight AVR microcontrollers which control the LEDs, 8 CPLDs to manage the weight sensors which make the floor interactive, and an FPGA and embedded computer to tie everything together. It’s movable, a hit at parties, and so far it seems to hold up to the occasional spilled beverage. You can’t share a project like this without some video. See it after the break.